Tommy Flanagan, piano; Doug Watkins, bass; Louis Hayes, drums. In the jazz vernacular cat has come to designate anyone of the male gender rather than the more pointed reference to someone who is a jazz follower or the specific indication of a jazz musician. 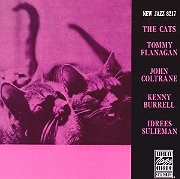 Despite the wide application of the term by musicians, when the collective nous "the cats" is used it more than likely refers to other musicians. But, specifically, who are The Cats? To begin with, Tommy Flanagan is one of the best of the many, good, new pianists to become prominent in jazz during the past few years. Originally from Detroit, where he played with Billy Mitchell, Milt Jackson and Kenny Burrell, Tommy came to New York in 1956 and subsequently played with Ella Fitzgerald, J.J. Johnson, Miles Davis, and Sonny Rollins. He is highly rated by fellow musicians for his wonderful touch and rolling lines. Tommy's little delays and their attendant plunging forays are alwasy a spur to interested listening. While not a flashy player, he is nevertheless a highly accomplished keyboard artist. Flanagan's style, out of Bud Powell, Hank Jones and Barry Harris, is never tricked-up; he communicates directly and warmly in a manner which puts him ahead of many pianists erroneously considered to be his peers. John Coltrane, a Philadelphian who played with Dizzy Gillespie in the early Fifties and came to prominence with the Miles Davis quintet and Thelonious Monk's quartet before rejoining Davis' sextet in 1958, is now recognized as one of the important new voices in jazz, one who has already started influencing his contemporaries. Trane, swiftly developing his personal conception even further since the time of this recording is, nevertheless, in typical, what for now has to be called middle-period Trane form. While not as adventurous as Coltrane, Idrees Sulieman is not a pat jazzman by any means. He speaks with an emotional horn that warms as it leaps and turns. A native-born Floridian who has made his home in New York since the mid-Forties, Idrees was originally influenced by Dizzy Gillespie and Fats Navarro. He absorbed these with taste and understanding and also shows the effect that the late Clifford Brown had on his contemporaries. Kenny Burrell's swing and strong blues feeling always come across naturally. There is never a hint of straining for effect but his ease of playing does not make his offerings any less hot. Although Kenny was first influenced by Charlie Christian, his more recent shaping forces come from other modern instrumental sources than the guitar. Doug Watkins and Louis Hayes, like Flanagan and Burrell, are Detroiters who made good in New York during the Fifties. Both have played with Horace Silver (Hayes is with him at this writing) and Art Blakey and are exemplary rhythm players who can solo intelligently when called upon. These are The Cats and their song won't bring any barrage of old shoes except from the ilk of Music USA (Metronome to you older readers) editor Bill Coss, who wrote in the February 1959 issue when reviewing a record by Sonny Clark, "Hard-bop seems to do best when it expresses hate or some other emotion of violent expression. (Could he mean love?) This is polite and infinitely more restrained than is usual, so it is not as successful in its results as are the other more normal expressions of that school of jazz." With all his spouting about hard bop, why doesn't he conceive another term (how about bebop, Jim? That's a good one!) instead of trying to fit the music into his own narrow conception. "Minor Mishap" is a medium-up minor tune by Flanagan with solos by Coltrane, Burrell, Sulieman and Tommy. The four exchange four bar bits with Hayes at the end. Flanagan next offers a simple but effective "How Long Has This Been Going On?" with rhythm accompaniment. Tommy includes the seldom-heard verse here too. "Eclypso," first done by Tommy in a trio version (Tommy Flanagan Overseas - Prestige), goes from the island bit of its theme into 4/4 for the blowing, done by all the principals. Side B opens with another minor-keyed opus by Flanagan. "Solacium" is more subdued than "Minor Mishap" and has no modulation like the later. An earlier performance of this tune was done by Tommy with Bobby Jaspar in Flute Flight (Prestige). Here, the four main soloists again are the contributors. A slow, rocking blues, "Tommy's Tune," completes the set. Everyone gets a chance to work out on this thoughtful, soulful number, including Watkins who is an excellent blues man.